For the most part this week has been another one of painting and very little else. We’ve been trying to fit in another walk but on the days available …when Nita’s not working and I haven’t been busy, well, the weather has been a bit rough. From the mountain forecasts though, it did seem like there would be a brief lull in the inclement weather, either Thursday or Friday this week and so if we were to get out it would be on one of these two days. As it turned out Thursday gave us the best chance of avoiding the rain and low cloud …especially if we went east and a little north …a big-ish day in other words! 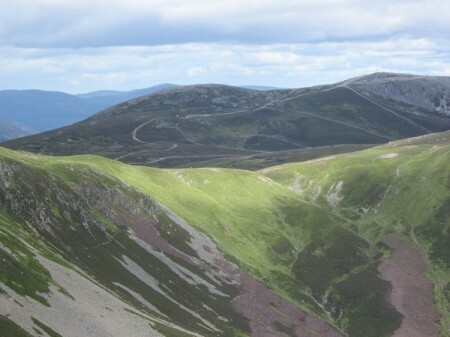 Our original idea was to travel all the way up to Lochnagar on the Queens Balmoral Estate and after checking that there would be no stalking taking place, we got out the maps and a guide books for the area. It looks a wonderful hill …one that I’ve always wanted to visit, but when we got the road map out to find out how to get there, we realised that it would mean a drive of probably three and three quarter hours each way. This is probably just a bit too far for a day trip, especially with only one driver and the prospect of a big and quite tiring walk once we got there. 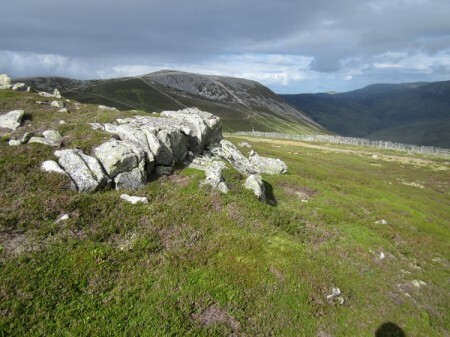 If we’re going to walk Lochnagar, then we’ll need to stay over night somewhere near the hill I think. That (at 22.00 on Wednesday evening) left us still not knowing where we were going the next day. After a little more pondering I suggested we go back to Glen Shee and walk the three hills to the immediate west of the Glen Shee Ski Centre…. Carn Aosda 917m, Carn a’ Gheoidh 975m and The Cairnwell 933 m. The first and last of these three hills lie close to the ski centre, (which itself sits at just over 600m) and so they are no more than a short if steep walk from the start point. 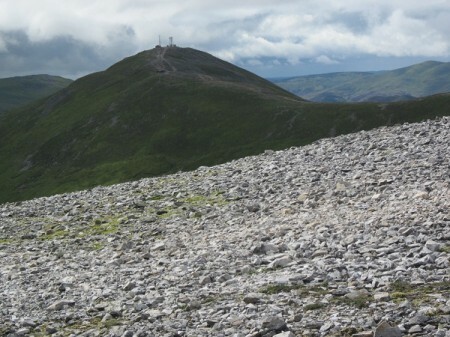 Both are littered with the paraphernalia connected to the ski centre ….ski tows, fences, and large bulldozed tracks … not to mention the big communications masts sitting atop The Cairnwell itself. To the west of these hills though the country returns to the wild open moss and rock covered tops and it’s out here that Carn a’ Gheoidh lies. We visited these hills seven years ago on a rather grim December day, our plan then, to start with The Cairnwell, then out to Carn a’ Gheoidh and finally Carn Aosda before the short descent to the car at the ski centre. It’s a 3 hour drive to Glen Shee from Irvine and we’d left very early in order to arrive at first light. We were walking up the steep slopes of The Cairnwell as the sun came up and we arrived after about 50 minutes to stand at the summit in bright sun and surrounded by snow covered hills. Alas though, within half an hour low thick cloud had rushed in and that was the last view we had. The trip out to Carn a’ Gheoidh that day was a difficult one with snow on the ground and thick cloud …it wasn’t quite a white out …but it was very white all the same and made for difficult and time consuming navigation. In short we got a little lost on our way back and with the light fading had some anxious moments before finally finding our way back to the edge of the ski centre …and the very welcome sound of the ski tow generators down below in the glen. 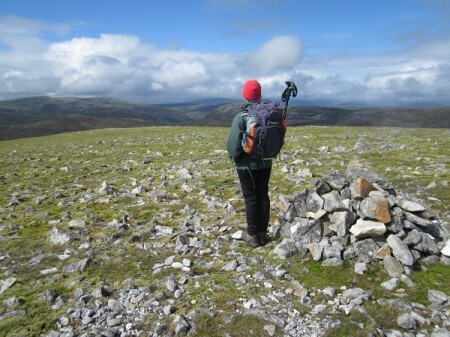 Needless to say we never reached the top of Carn Aosda that day. Yesterday however, with fine weather and long hours of day light, it was an easy and very relaxing walk and the views all around were extensive. We got to see everything we’d missed in the cloud and snow the previous visit and found where we’d gone wrong on our return from Carn a’ Gheoidh that time. Yesterday, instead of the mad dash down to the ski centre in rapidly fading light, we had a leisurely stroll down the steep but soft, moss covered slopes of The Cairnwell …45 minutes from the summit to the road. For this visually impaired walker and his guide, descents are normally stressful, tiring and very long – yesterday’s was an absolute pleasure!